(NaturalNews) Yesterday I unveiled the Food Rising Mini-Farm Grow Box in an exclusive video broadcast at the Health Freedom Expo in Naples, FL. You can now watch that full video here (see links below). Credit for the teaching of "non-circulating hydroponics" belongs to Professor B. Kratky at the University of Hawaii, Hilo. His academic paper describing this technology is linked at the home page of FoodRising.org. Using almost any 3D printer (and the correct filament, which is called "t-glase"), any person can print their own self-watering float valve and use it to grow their own food with very little effort and at very little cost. DIY VIDEO: Also on Tuesday, my DIY video shows you how to build these systems yourself using common tools and parts you can find at any hardware store. We are currently raising funds to donate 250 of these grow systems to schools across America. Funds have so far been acquired for over 207 of these systems, and we have approved donation requests from over 100 schools, churches and community centers (with more donation requests arriving each day). 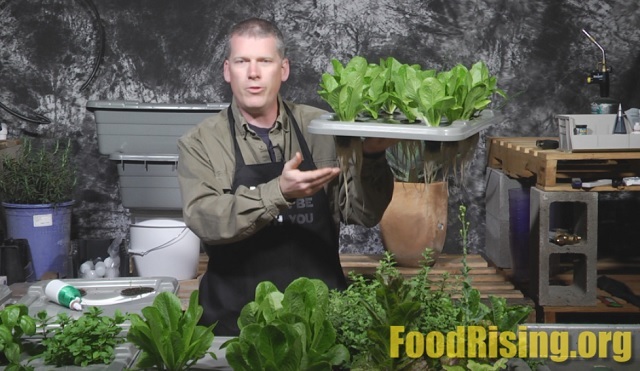 If your organization would like to receive a Food Rising Mini-Farm Grow Box donation, donation request instructions are found here. Greek citizens dumpster dive for food... do you have a Food Rising Grow Box yet?